With this post, I’m opening the doors to an exciting project that has the entire Tridel team beaming with pride. Let me invite you to enter The Lobby, our high-tech experiential showcase now operating at 4800 Dufferin Street. The Lobby breaks new ground for Tridel (maybe even the industry) by providing our buyers with a uniquely integrated way to customize their new homes and make personalized choices. By fusing high-tech with real touch-and-feel, The Lobby provides highly customized and efficient condo-buying experiences. 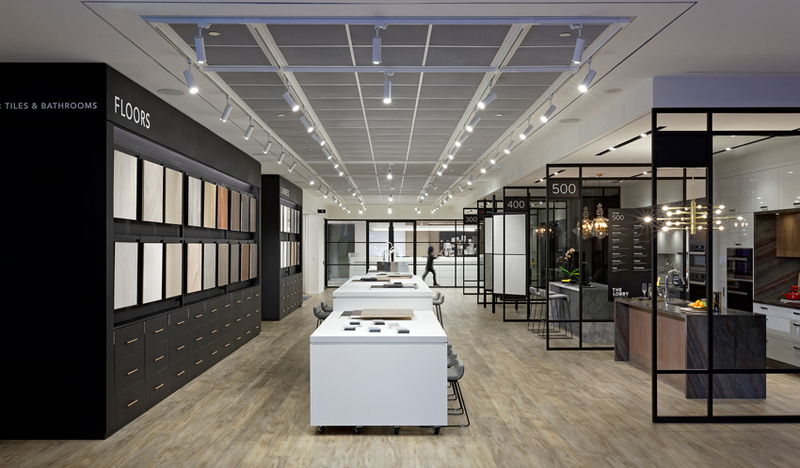 For Tridel, The Lobby and the Tridel Design Studio, (its companion digital exploration tool or “app”) is more than a way to enhance the selection process and deliver buyer satisfaction. It’s also a venue that lets us identify and implement design solutions to be applied to future projects. We’ve been so complete in our thinking about the buyer journey, we can even display the impact of personal selections on a mortgage. I think The Lobby is significant for our buyers, our business partners and to how Tridel operates – as a builder committed to innovation. So I plan to share its story via three posts. This one will be followed by a second on how we worked with our external design collaborators; the third will spotlight new technology for viewing design options. 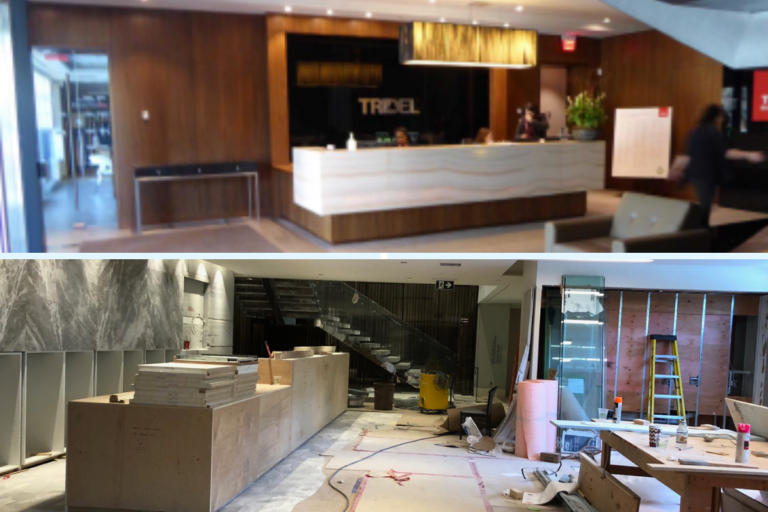 To write these posts, I interviewed Tridel teammates with key roles in the project. Hearing The Lobby story through their voices will help you appreciate the passion and planning that went into it. 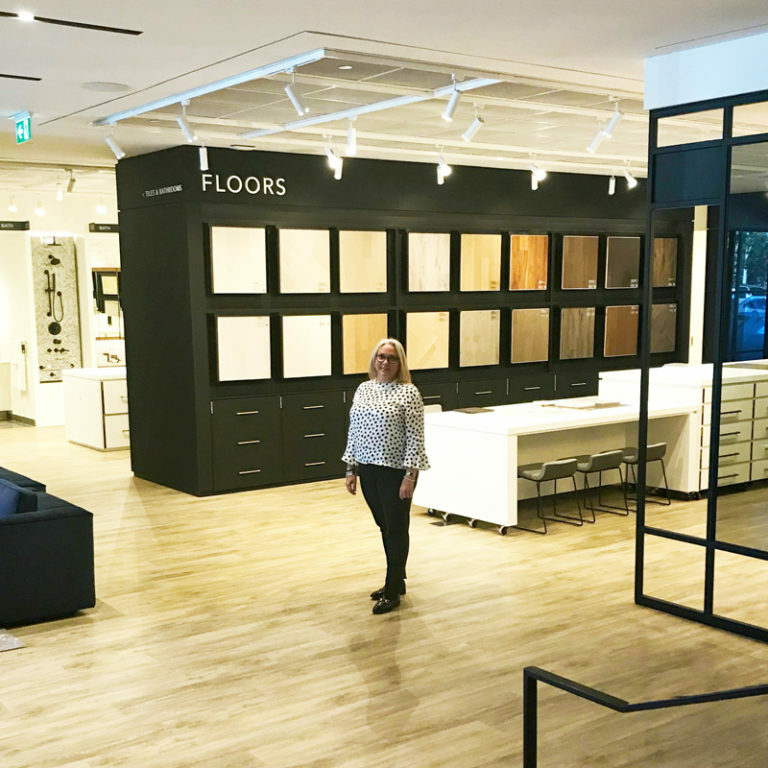 Another key aspect of combining the in-person and digital experiences through The Lobby and the Design Studio app, says Danielle, is that it allows buyers to experience the design discovery phase much sooner. 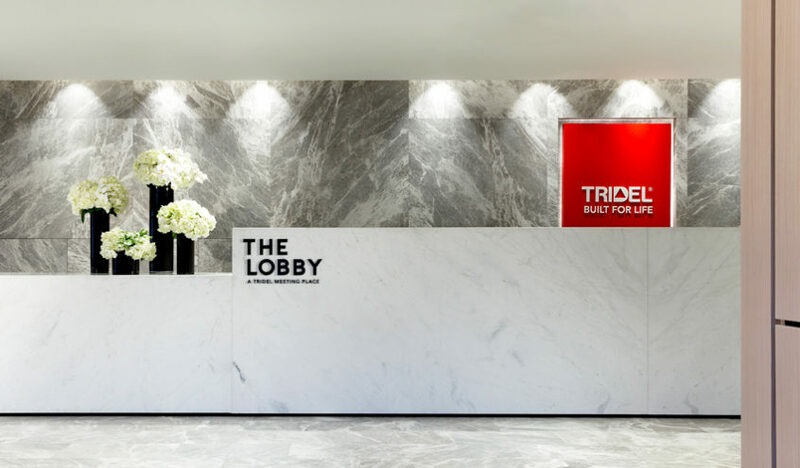 Tridel SVP, Brand Experience, Danielle Feidler was part of the team that created The Lobby. The previous reception area (above) underwent extensive renovation to make way for The Lobby. 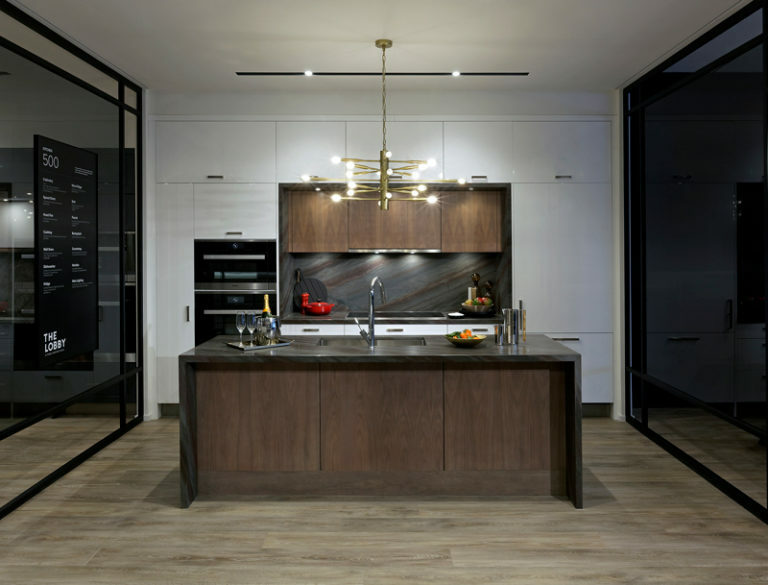 For his part, Jim acknowledges that The Lobby – its creation and how it enhances our working processes – was so new for Tridel, at the outset there was no clear path for how to make it happen. Bringing it to life called for change management (internally and with the trades), smart collaboration among Tridel’s various stakeholders and focusing on delivering the best customer experience while being business savvy. With a “built-for-life” philosophy, Danielle and Jim envision The Lobby hosting curated design events, employee events and educational seminars for homebuyers. I like that idea. I would also add that being a builder isn’t just about the homes people buy. It’s about the community as well, so The Lobby is a place where we can invite back members of communities we’ve already built. I hope you now get why we’re so excited about The Lobby. In my next post, I’ll tell you more about what makes us feel that way. Meanwhile, here are some parting thoughts from our SVP, Project Management, Bruno Giancola: “The Lobby makes me so proud. It’s amazing how many positive comments we’ve had from partners, trades, suppliers and consultants who have come through the space since it opened. They say it demonstrates our ability to be best in class and makes them excited to be part of our team. You’re welcome to explore The Lobby for real. You’ll find it at: 4800 Dufferin Street and we are open for public browsing Saturday and Sunday, 12 noon to 5 p.m.
Andrea DelZotto is a senior leader at the Tridel Group of Companies, a third generation member of the founding family and a mom to three active and growing boys. Her focus at Tridel is on people, culture, customer experience, innovation and community and ensuring consistency in each of these areas across all Companies within the Group. Every month on the Real Condo Life, she shares her thoughts and ideas blog about residential real estate, vertical living, sustainable development, innovation, teamwork and what it’s like to be a woman in a traditionally male-dominated industry—as well as some occasionally random thoughts. Disclaimer stuff: We love this blog and really wanted to include it on our site. But we need a disclaimer. So here goes: From time-to-time, the Tridel.com site hosts guest bloggers. The views, opinions and positions expressed within these guest posts are those of the author alone and do not necessarily represent those of Tridel Corporation. All information and data provided on guest blog posts is for entertainment purposes only. The accuracy, completeness and validity of any statements made within this article are not guaranteed. We accept no liability for any errors, omissions or representations. The copyright of this content belongs to the author and any liability with regards to infringement of intellectual property rights remains with them.